What Is the Difference Between the American and European Roulette? What Are the Main Elements of a Roulette Game? What Different Kinds of Inside Bets are There? What Kinds of Outside Bets are There in a Roulette Game? What Are the Minimum and Maximum Bet in Roulette? You always wanted to learn how to play Roulette, but all of your attempts so far have failed because everything seems so confusing. Don’t worry my friend, after reading this simple guide for beginners, you’ll be ready to sit at any Roulette table and play confidently like a professional. For all those people who saw a Roulette game only in movies, you should know that there are two versions of this beloved casino game that dates back to the 17th century. Newbies may think this is a petty difference, but it positively affects your odds of winning. The European wheel consists of 36 numbered pockets and a 0, while American roulette has an additional double 0 pocket. This additional pocket directly lowers your chances to win the game. Besides, the house edge on European Roulette is around 3%, while on the American wheel it is somewhat over 5%. So whenever you can, choose a European Roulette to gamble on. In addition to the spinning wheel with numbered pockets and a ball, there is a Roulette table as well. On it, you can find a layout of all the roulette numbers following the same color pattern as on the wheel, i.e. red and black. This layout may seem a little confusing to a novice player, but once you finish reading this text, every detail about the roulette game will fit in perfectly. There is an outer circle of differently marked fields that surrounds the center of the table filled with numbers, and this part of the table plays an important role in the Roulette game. I’ll go back to this later on when I get to the betting options. Now that you know what a Roulette table and wheel look like, let’s see what you need to start the game. Another essential thing that sets this casino game apart from others is that there are special chips you can only use in a Roulette game. You can get these differently colored chips either for cash or chips that the casino you play in use. 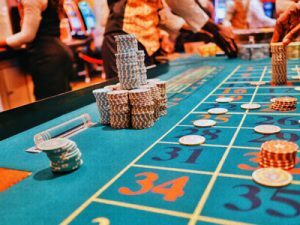 Now that you got familiar with the essential elements of this game and you’ve obtained your Roulette chips, it is time to get familiar with various options you can choose to bet on. These bets all include numbers that fill the inner area of the roulette table. I have to stress out the fact that they are arranged vertically, starting with number one in the lower left corner, and ending in the upper right corner of the roulette table with number 36. This layout is also divided into three equal parts containing 12 numbers each. You can try the Bond tactics and bet persistently on a single number. This is called a straight-up bet, and since the odds of hitting this are the lowest, straight-up bet pays out an amazing 35:1. You can choose two numbers side by side on the table, and spread your chips on them. This is the so-called split bet, and you win if either one of your numbers wins. You will get a 17:1 payout in case of winning this bet. If you decide to play for the game’s sake and try out different bets, there is also a corner bet you make when you put your money on four different numbers that form a square on the board. For example, 7,8,10 and 11. This bet will pay you eight times your original bet. You can also bet on three numbers in a row, which will get you 11:1 winning. This is known as a street bet. There is also a six-number bet that covers two vertical lines of numbers on the table and pays out 5:1. A five number bet is reserved for the seasoned players, and it is not recommendable for rookies to play. This is because it involves some hard-to-hit numbers like 0 and 00 or 1,2, and 3. Red or black — where you bet on the color of the winning number. Odd or even — you bet whether the odd or even number will come out. Low or high — here you have to choose between the low numbers (from 1 to 18) or the high numbers (from 19 to 36) on the table. All of the mentioned bets pay out 1:1. There is also a columns bet, where you can spread your chips on all twelve numbers in a horizontal line, or you can opt for betting on one of three vertical dozens on the Roulette table. Both of these options will pay 2:1 in case you win. Every casino game has a minimum amount of money you have to place as a bet to be able to gamble. You should find out what the minimum and maximum bets are in a Roulette game you want to play so that you can be sure that the game suits your bankroll. Bear in mind that different betting systems require different minimum bets. If you choose to place a minimum bet of let’s say $1 on an inside bet, you would be able to spread that on several different bets. For example, you can use four $0.25 chips to make four different bets. However, if you opt for an outside bet, you will have to choose one particular bet, and place the $1 minimum on it. To sum it up, there are several simple tips you should follow to be ready to sit at the Roulette table and start this exciting game. Always chose the European Roulette because you will increase your chance of winning. Also, there is a lower house edge in this game. Do not choose the betting options you are not ready for. In other words, avoid the five-number bet. Always opt for an inside bet because you can spread a minimum bet on several different bets. Take care of your bankroll. Try playing a free Roulette game that numerous online casinos offer. By doing so, you will make sure you get the hang of it. Roulette is one of the oldest casino games, and it doesn’t matter if you’re 18 or 70, you’re bound to have fun. Remember, it is a game of chance and all these strategies don’t work. But this doesn’t mean you shouldn’t test them out for the sake of fun, just make sure to be responsible. Best of luck!